Nickname(s): "Junction", "River City", "Colorado's Wine Country", "Capital of the Western Slope", "Ol' Grandy"
The Country Jam Ranch is located near Grand Junction just north of I-70 at the Mack exit. This is a permanent festival site built for music festivals, including Country Jam, an event that has been held since 1992 and one that draws thousands of country music fans to the area. The Grand Junction area has turned into a major mountain biking destination, with many bikers coming from the Front Range of Colorado, the Salt Lake City area, and even as far away as California to enjoy the area's abundant single-track trails. Two prominent trails among others are the Tabeguache and Kokopelli trails, the latter running from near Loma all the way to Moab, Utah. Fruita, Colorado with its 18 Road trail system is within 10 miles of the city and has become a major mountain biking destination. To the northeast, the weathered Little Bookcliffs cut across the skyline. 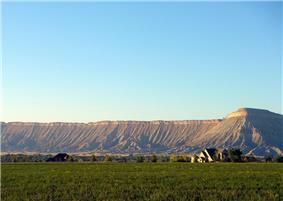 To the southeast soars the Grand Mesa, one of the world's largest flat-topped mountains. The photogenic canyons and monoliths of the Colorado National Monument form a western wall. In between the three natural barriers sprawls Western Colorado's Grand Valley. Cut out of the rugged terrain by the Colorado and Gunnison rivers, the valley was also one of the last locales in the lower 48 states to be settled by pioneer Americans. The region's colorful history stretches much further back in time. A little-known aboriginal civilization known as the Fremont first moved into the area about 200 A.D. Living in pit-houses, eating insects, small animals and sparse produce from tiny gardens, the mysterious Fremont left Western Colorado about 1300 A.D. Roughly 100 years later, the first bands of wandering Utes moved into the region. The various Ute tribes eventually called much of Colorado and Utah home until forced onto reservations in 1881. Both Indian groups left behind numerous examples of colorful rock paintings and canyon carvings. Some of the unexplained rock art can still be spotted today. Until 1821, the Grand Valley was part of the kingdom of Spain. And during the early and mid 1700's, hardy Spanish and Mexican soldiers, explorers and priests poked and prodded through the region. Some were looking for gold, others seeking new trails to Spanish California. Most were not too successful. At first, trail-blazing American mountain men weren't very successful either. Hoping to trap valuable beaver or trade with Ute Indians, most of the Americans were kept out of the territory by Spanish officials. However, when Western Colorado became part of Mexico in 1821, the mountains were suddenly wide open to trappers, traders and wandering buck-skinners of the U.S.
A few of the same mountain men to first see Colorado's Western Slope later helped guide U.S. Army expeditions and Government Surveying parties through the region. Some of the Old West's best known explorers - Kit Carson, John Charles Fremont and Capt. John Williams Gunnison - all passed through the Grand Valley in the 1840s and 1850s. In spite of anti-Indian politicians, a large part of Western Colorado remained Ute Indian Territory until September 1881. The region was opened to homesteaders, ranchers and town builders the very day the Utes were being forced out by Army troopers. By the time Kansas politician and real estate developer George Crawford decided the unclaimed Grand Valley would make a good town site, Denver, Colorado already had a population of 50,000. And Grand Junction, Colorado was just being born! According to the United States Census Bureau, the city has a total area of 38.6 square miles (100.0 km2), with 38.2 square miles (99.0 km2) of it land, and 0.39 square miles (1.0 km2), or 0.87% of it water. The downtown area displays a semi-arid climate (Köppen BSk), almost grading into an arid type. Grand Junction sits in a large area of "high desert" lands in Western Colorado. Winters are cold and dry, with a January mean temperature of 27.4 °F (−2.6 °C). Due to its location west of the Rockies, Grand Junction does not receive as much influence from the Chinook winds as locations in Colorado east of the Front Range, yet it does receive protection from the Arctic masses that can settle to the east of the Rockies. This is illustrated by the fact that from December to February, highs reach 50 °F (10 °C) only 18 days. Lows drop to 0 °F (−17.8 °C) or below on 2.9 nights per year. Snowfall is low compared to much of the rest of the state, averaging 19.1 inches (49 cm) per season; only once in the entire period of record dating to 1893, has observed 10 inches (25 cm) in a calendar day, though the median is 6.3 inches (16.0 cm), and moreover, snow cover is intermittent. Snow is greatest in December and January. Spring warming is gradual but quickens when nearing June; the average last freeze date is April 24. Summer is hot but dry, with a July mean temperature of 78.2 °F (25.7 °C). Grand Junction averages 64.5 days a year with temperatures at 90 °F (32 °C) or above, and an average 6.5 days attaining 100 °F (38 °C) or more. Autumn cooling is rapid, with the average first freeze date being October 15. The area receives little precipitation year-round, averaging 9.42 inches (239.3 mm), with no real seasonal spike. Sunshine hours are abundant, even in winter, and total just over 3200 hours per year, or 73% of the possible total. The median income for a household in the city was $33,152, and the median income for a family was $43,851. Males had a median income of $31,685 versus $22,804 for females. The per capita income for the city was $19,692. About 7.5% of families and 11.9% of the population were below the poverty line, including 11.8% of those under age 18 and 9.0% of those age 65 or over. From the time settlers arrived in the 1880s until the 1960s, three of the main economic activities in the region were farming, fruit growing, and cattle raising. Fruit orchards, particularly between Grand Junction and Palisade to the east, remain important to the region's reputation and economy to the present day. Fruits most often grown are peaches, pears, apricots, plums, cherries, and, particularly since the 1980s, grapes for wine. In this semi-arid environment, these orchards thrive from a combination of abundant sunshine and irrigation from a system of canals that divert water from the Colorado River. Retail sales have been important to the economy for decades (e.g., gasoline, and hunting and fishing related sales), and uranium mining-related activities have also been significant. Grand Junction was home to the Climax Uranium Mill, a now decommissioned mill that provided uranium ore to the US Atomic Energy Commission. Education and healthcare have been important to the economy of the area, especially since the 1950s, with Colorado Mesa University and St. Mary's Hospital as leading employers in these fields. Vast oil shale reserves were known to exist near Parachute, Colorado in the Piceance Basin. The oil embargoes of the 1970s and high gas prices resulted in major financial interest in the region. Exxon purchased rights and used Grand Junction as its seat of operations. By 2008, the economy of Grand Junction appeared to be more diverse and stable than it had been in previous decades. Major contributors to the economy were health care, tourism, agriculture, livestock, and energy mining (gas and oil). Major energy companies had once again invested large amounts of money due to increases in oil and natural gas prices (such as in the years 2005–2008). However, a major drop (in the summer of 2008) of market natural gas prices led to reduced gas well drilling and related capital expenditures in the area, significantly slowing the Grand Junction economy in 2009. Reports given in 2009 suggested that Grand Junction had once again been hard-hit economically, with one report by April 2010 listing the area as having had the largest percentage drop in employment of any "small city" in the entire United States. By 2008, Grand Junction was being discovered by the "nation's elite business and leisure travelers" for private jet travel, with nearby Powderhorn Resort and other ski resorts a major attraction. Dalton Trumbo (1905–1976), Academy Award-winning screenwriter (Exodus, Spartacus, Roman Holiday, Thirty Seconds Over Tokyo), novelist (Johnny Got His Gun) and member of the Hollywood Ten. His childhood home was located at 1124 Gunnison Avenue in Grand Junction. He is honored with a Dalton Trumbo Free Speech Fountain on the campus of his alma mater, the University of Colorado. His first novel, Eclipse (1934) was set in a fictional town based on an unflattering Grand Junction, and many of the characters are identifiable as community leaders. A statue commemorating the loved and hated Trumbo is on Main Street in front of the Avalon Theater. Walter Walker, political leader and publisher made Grand Junction his home for many years. For three months in 1932, he served as one of Colorado's US Senators, and was publisher and primary owner of the Grand Junction Daily Sentinel newspaper. In addition, the district operates numerous middle, elementary, and other types of schools. District 51 partners with the Western Colorado Community College (WCCC) to operate a vocational school, owned and operated by Colorado Mesa University. The WCCC was formerly named, and is still commonly called, UTEC. Colorado Mesa University, a public, four-year, liberal arts institution, serves as the primary provider of higher education on the Western Slope from its campus in central Grand Junction. This campus has an average enrollment of just under 10,000 students and offers a variety of degrees, including a Masters in Business Administration, Educational Leadership, and ESOL. Grand Junction Regional Airport (formerly Walker Field Airport) serves as the major airport in the area. The airport is located in north Grand Junction on Horizon Drive. As of 2011, two-way flights to Denver, Salt Lake City, Las Vegas, Dallas, Phoenix, Los Angeles, and Houston were available. Amtrak, the national passenger rail system, provides service to Grand Junction Station, operating its California Zephyr daily in both directions between Chicago and Emeryville, California, across the bay from San Francisco. The Grand Valley Transit (GVT) is a regional transit system serving the grand valley. It operates 11 bus routes in the area as well as a "dial-a-ride" service. Grand Junction, Colorado has placed number six in Outdoor Life's 2012 list of The 35 Best Hunting and Fishing Towns in the US, number twelve in Forbes 2012 list of The Best Small Places For Business and Careers, number five in The New York Times 2011 list of Where to Live to Avoid a Natural Disaster, and number seven in Tourism-Review.com's 2009 list of the 8 Sunniest Cities in the USA. The Grand Junction radio market includes all of Mesa County, Colorado. Six AM radio stations and more than 25 FM stations are licensed to and/or broadcast from the city. Grand Junction is serviced by two newspapers, the Daily Sentinel (daily) and the Grand Junction Free Press. 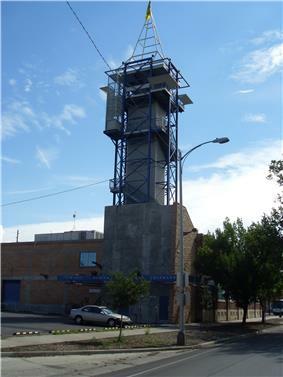 The Grand Junction area also receives newspaper influence from the Front Range such as the Denver Post. Grand Junction has ABC, NBC, and CBS television station affiliates under the call signs of KJCT-LP (Channel 8), KKCO (Channel 11), and KREX-TV (Channel 5) respectively. Also, Grand Junction has a Fox (Channel 4) affiliate station under the call sign of KFQX that receives news from the Denver FOX affiliate, KDVR (Channel 31) at 9 pm. KGBY (Channel 20) broadcasts Cozi TV programming. KRMJ (Channel 18) is the local PBS affiliate, part of the statewide Rocky Mountain PBS network. Grand Junction's downtown is home to the historic Avalon Theatre which hosts both movies and live entertainment from documentaries like March of the Penguins to live performers such as "Weird Al" Yankovic, Wilco, Colbie Caillat, Chris Isaak and Brian Regan. In the 2010 short story Vilcabamba, Grand Junction becomes the capital of the United States after an alien invasion. ^ "Profile of General Population and Housing Characteristics: 2010 Demographic Profile Data (DP-1): Grand Junction city, Colorado". U.S. Census Bureau, American Factfinder. Retrieved November 22, 2011. ^ "Geographic Identifiers: 2010 Demographic Profile Data (G001): Grand Junction city, Colorado". U.S. Census Bureau, American Factfinder. Retrieved November 22, 2011. ^ a b c d "NowData – NOAA Online Weather Data". ^ "GRAND JUNCTION WALKER AP, CO". In Climatography of the United States No. 20 1971–2000. U.S. Department of Commerce, National Oceanic & Atmospheric Administration, National Environmental Satellite, Data and Information Service. ^ "Climatological Normals of Grand Junction". ^ "Station Name: CO GRAND JUNCTION WALKER FLD". National Oceanic and Atmospheric Administration. Retrieved 2014-03-29. ^ "WMO Climate Normals for GRAND JUNCTION/WALKER FIELD CO 1961–1990". National Oceanic and Atmospheric Administration. Retrieved 2014-03-11. ^ "Monthly Averages for Grand Junction, CO – Temperature and Precipitation". The Weather Channel. Retrieved 2008-11-02. ^ Richard Williamson (October 5, 1999). "Oil shale collapse preserved scenic vistas". Denver Rocky Mountain News. Retrieved June 3, 2009. ^ "City of Grand Junction CAFR" (PDF). Retrieved 2012-08-12. ^ Nichols, Josh (2007-10-14) Trumbo sculpture unveiled. Post Independent. Retrieved on 2013-08-23. 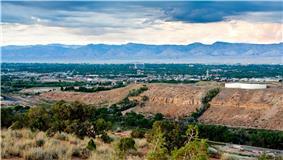 ^ "Facts and Rankings – Grand Junction Economic Partnership". Grand Junction Economic Partnership. Retrieved June 29, 2012. ^ "2012 Arbitron Radio Metro Map" (PDF). ^ "Radio Stations in Grand Junction, Colorado". Radio-Locator. Retrieved 2014-08-25.